There was an interesting article in the Financial Times on Monday (June 26, 2017) – Why US big business is listening to Bernie Sanders – which, despite the somewhat misleading and over-the-top headline, tells us a little of the way the full neo-liberal attack on workers is in regression. Not, I might add because of any philosophical or moral consideration. But, rather, the top-end-of-town is starting to work out that their headlong race-to-the-bottom approach over the last three decades is not actually in their best interests. The top-end-of-town is not that bright. More brutish than bright and it takes some time for them to work out what we have known all along. Globalisation mixed with neo-liberalism is poison. Globalisation mixed with social democracy is progress. The FT article essentially recounts an interview between the journalist and the outgoing head of US multinational General Electric. First, that Bernie Sanders’ (described as a “leftwing populist”) strategy to use a “grassroots approach to connect with workers” is the way to go. The era of attacking public services, workers’ rights and their capacity to share in productivity growth and buying off the resistance that one might expect as a result with increasing mass consumption possibilities facilitated by increased access to credit (as real wages growth stagnates) has not delivered. We have been making this point for some decades and finally the corporates are realising the credit-binge, flat wages approach with outsourcing, privatisation and increased financialisation does not bring stable economic growth. It brings increasing inequality, financial instability, degraded productive sectors and public infrastructure. It is not the increased globalisation of supply chains that is at fault. Rather, it is the neo-liberal policy overlay that has been the cause of the problems. For example, if governments had have enforced fair trade rules then the capacity of multinational firms to exploit ‘cheaper’ labour would have been reduced. Further, if governments had not allowed the financial sector to spiral out of control, then the access to credit would have been more limited and this would have forced firms to realise earlier that they have to allow real wage rises in proportion with productivity growth to ensure that domestic demand could absorb production. Please read my blogs – The mass consumption era and the rise of neo-liberalism and The Left confuses globalisation with neo-liberalism and gets lost – for more discussion on this point. The best way to share the benefits of globalisation … is to copy the Germans, and in particular the “Mittelstand” companies’ model of vertically integrated manufacturing ecosystems, often anchored by a large group and surrounded by smaller ones that support it. In this model, highly skilled (and highly paid) workers create high-value goods for export. However, the German industrial model and export-bias are not a sustainable model for world development. Please read my blog – Germany is not a model for Europe – it fails abroad and at home – for more discussion on this point. Export-led growth strategies typically require other nations running extended current account deficits. It sufficient diversification and specialisation occurred then more nations could exploit an export-led approach. But what typically happens is that a few nations become dominant across a wide range of products/services and then rely on the rest of the world importing from them. Where the “Mittelstand” companies provide a model is in their regard for the value of their workforces and the way in which vocational training is embedded in the hiring and production process. But we knew about the benefits of pursuing a so-called ‘high-wage economy’ in the C19th. For example, John Atkinson Hobson (born 1858) was a British economist who sought to integrate liberal social ideas with democratic socialist principles. Please read my blog – Rising inequality and underconsumption – for more discussion on this point. … includes the whole of the economic rent of land, and such payments made to capital, ability, or labour, in the shape of high interests, profits, salaries, or wages, as do not tend to evoke a fuller or a better productivity of these factors … is the principal source not merely of waste but of economic malady. For it represents the encroachment of a stronger factor upon a fund which is needed, partly for increasing the efficiency of other factors, labour in particular, partly as social income to be expended in enlarging and improving public life. This unproductive surplus, moreover, as ‘unearned income’ acts upon its recipients as a premium on idleness and inefficiency spent capriciously on luxuries, it imparts irregularity of employment to the trades which furnish these; saved excessively, it upsets the right balance between the volume of production and consumption in the industrial system. A modern way of saying the same thing is that the real wages of productive labour have to grow in proportion with productivity and profits should be reinvested to enhance productivity growth. Otherwise there is a mismatch between production and consumption, which, in the neo-liberal period, was temporarily pushed aside by the massive growth in credit. However, that ‘solution’ has proven to be unsustainable. Chapter XIX of Hobson’s book is entitled “The Human Interpretation of Industry” where he makes the case that focusing on the working experience is as important to society as the utility derived from consuming the goods and services arising from that work. … treating him as the sole repository of a will and intellect which uses labour and capital, as it uses natural resources, as mere instruments for its creative energy to work with. This is, of course, in direct contradistinction the hero view that Ayn Rand developed in Atlas Shrugged and is a recurring theme that the wealth generators are the bosses. So while consumption is important to our well-being, so is work and the ability to exercise our capacities and receive adequate rewards. … for every dollar of economic value they create, the community itself earns another $1.50. That’s why even though technology has decreased the overall number of manufacturing jobs in the US, the positions that exist may still end up supporting a large amount of high-quality economic activity. The idea of the expenditure multiplier were core macroeconomics before the neo-liberals came along. They sought to play down the idea because they wanted to mount a case that government spending was wasteful and eroded national income. This was the crowding out thesis whereby a $1 of extra public spending would generate an increase in GDP of less than a $1 and the more extreme versions of the thesis predicted that national income (GDP) would actually fall (negative multiplier). The argument was always false and the GFC has demonstrated that. Remember the infamous IMF mistake which underpinned the Greek bailout and related austerity program? The IMF adopted the mainstream position of multipliers less than 1. So cutting goverment spending would lead to an increase in total GDP. In 2012 they were forced to admit they had made a grave error and the multipliers were more like 1.6 – which explains why the Greek economy collapsed. Every net government euro taken out by austerity led to a further 60 euro cents of private spending falling off. The point is there are strong regional multipliers arising from regional industrial strategies that emphasise strong investment, high real wages growth and localised procurement. The race-to-the-bottom approach which includes hacking into public educational investment at all levels undermines “the most important thing” that the GE CEO believes influences the success of his business. The lesson here is that public goods matter. Business doesn’t operate in a laissez-faire vacuum. Policy choices have an impact, and economic value flows to communities (or countries) that invest in things such as education and training. And these very ‘public goods’ have been at the forefront of the attack by neo-liberals. China is demonstrating the problems of the neo-liberal approach. The low-wage development has exhausted the coastal areas, which provided lower transport costs (access to ports). Workers are unable to live in the industrial cities along the coast. Further, the growth engine will have to move inland to the hinterland. But then the transport cost advantage declines and the demands for higher real wages bring the low-wage model to an end. This is why the Chinese government is intent on pursuing a domestic growth strategy through increased education and innovation. Chasing the low-wage dream in China has also led to industrial wastelands in the previous core economies, such as the US. The companies are now learning that the benefits of that approach are finite. Suppressed income growth reduces the growth in consumption expenditure. Without strong growth in investment, productivity slumps. Taken together, domestic demand stalls and sales become reliant on export markets that are unable to support the sort of growth the companies enjoyed in the golden years after the Second World War. I constructed this table (using AMECO macroeconomic data). It shows the evolution in the share of public and private investment in GDP (the “investment ratio”) from 1960 to the current day. As you can see, there has been, typically, a sharp decline in of both public and private investment shares over the decades, accelerating during the neo-liberal era. And in more recent years, consumption hasn’t picked up the slack and as a result, the neo-liberal era has delivered lower growth rates on average than the full employment era that preceded it. The message from the GE CEO is exactly that. 1. Firms have to return to investing in productive infrastructure rather than put their profits into the unproductive financial markets. 2. Public investment in education, training is crucial. 3. Public investment in physical infrastructure ‘crowds in’ private investment rather than the opposite. 4. The work experience is an important goal as much as the provision of high quality consumption goods and services. 5. Chasing low-wage nations to expand profits – via outsourcing etc – is a myopic strategy. It is better to develop home-grown talent that provides a virtuous cycle of spending, incomes and real benefits. But the Modern Monetary Theory (MMT) gang have only been saying this for 30 years or more. Don’t you want a ‘not’ in there? “The IMF adopted the mainstream position of multipliers less than 1. So cutting goverment spending would lead to an increase in total GDP.” ? I understand that an export led strategy for growth is impossible for all countries at any one time. And I intellectually understand that exports are a cost for an economy and that therefore, a trade surplus should be a cost. But what I don’t understand is why it seems that countries that have followed export led strategies and have run trade surpluses seem to grow and become prosperous if the model is unsustainable and loads extra costs onto their economies. I’ve never gotten how anyone could believe in “crowding out”. Where exactly do they think this borrowed money goes? In order for crowding out to be real, it would have to disappear (and yet we know that money only disappears via taxation). Or perhaps the claim is that government purchasing does not contribute to GDP? The whole idea is just nonsense (and not particularly difficult nonsense to figure out), and yet even the likes of the ostensibly liberal Paul Krugman is constantly inserting it into his analyses. How is it that these elite PhDs can’t see it? Is it that they simply refuse to balance their accounts, or does orthodox macro simply ignore the rules of accounting? Benedict, I used to believe that government borrowing would crowd out private borrowing until Professor Mitchell showed otherwise. Its what I was taught in college. It is very easy to believe if you think the loanable funds theory is accurate and there is a fixed supply of money. It may even be true under a strict gold standard, but we don’t have that now so it isn’t. Jerry: Yes, “not” is missing. Postkey; As said IMF were wrong and they finally admitted that “austarity(fiscal contraction) did not promote growth at all”. But they seems not really learning how to change their policies. 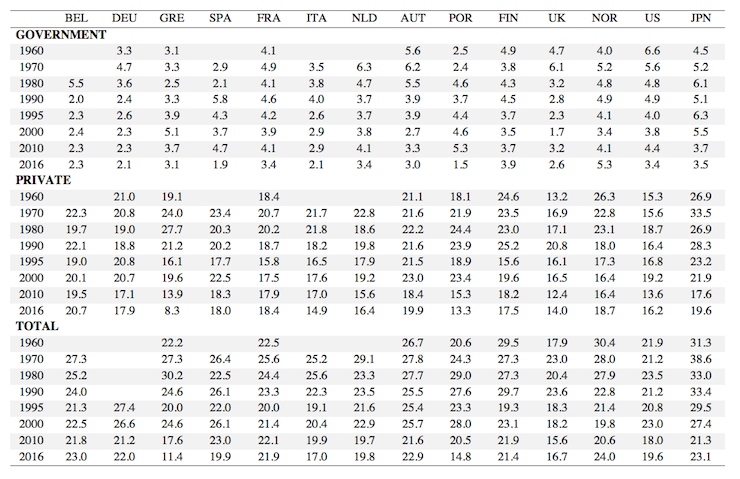 Instead they hope for markets to buy new EMU(ECB)-bonds based on sub-prime assets(Greece, Italy etc). With a multiplier less than 1, but not negative, a reduction of government spending will crowd out some GNP but still get som growth(IMF thought). If the multiplier is higher than 1(1,6), negative spending will generate negtive GNP. IMF now admitts the latter is the reality. It’s good to see here some evidence of the toxic power of the neo-liberal policies. It will also have coincided with the peaking of our techno-industrial dynasty. This occurred at about the time of the moon shot and perhaps coincidentally with the Nixon decision to go fiat. I think,[intuitively], that this peaking led, perhaps not consciously, to the expansion of credit growth. Was there a realisation that we had peaked at the time? The rise of neoliberalism after about 1965 seems more than a coincidence. Post war growth on cheap energy was by then running its course, but the desire for exponential expansion was still a major focus.All the supports for neo-liberalism were present by then. Now we face the reckoning. The GE director can see what is wrong, but unless he and we can get around to convincing people we have to change course, it won’t change. As long as they can account unpaid debt as an asset, things look OK. If at any time they have to admit that the unbalanced flow of money has finally bankrupted their customers and the debts aren’t assets any more, or they have to admit that there’s nothing they can buy with all the sequins that they were paid, then it’s over. Then they’ve lost valuable merchandise, and the resources and effort that went into that merchandise, and they’ve got nothing to show. I think you misinterpret the leaving of the GE CEO and his lessons learned for a broader education of corporate leaders. Reports I read said that he was widely criticized in his last few years and his successor will embark on an aggressive cost reduction strategy. Stock is down about 50% from when he started, and gained 4% the day he announced he was leaving. I don’t think much of anything will change until pretty much everyone realizes that workers are people and not machines. Machines can be shelved, replaced, disposed of, or even transferred across the world with only the company incurring costs. And the machine won’t care if it sits idle for a month or a decade. “Economists” almost criminal when they throw up their hands and say that social problems aren’t their concern as “scientists”. Corporate leaders continue the immoral behavior when the listen only to the message they want to hear. Government “leaders” are the worst because their job is supposed to be to care about the people. What’s the point of corporations, or the economy in general if citizens … people … can’t survive? Mercantalism works because what you are doing is stealing demand from other parts of the world instead of creating your own. And that’s only because creating demand within your own country makes the numbers look bad on the national balance sheet in Mercantilist terms. If a country sells its products for US dollars, it can stick those US dollars on the ‘asset’ side of the national balance sheet (in a sovereign wealth fund or whatever). Then the central bank can issue its own money against it by ‘discounting’ the asset. All the bankers are happy because you have ‘hard currency’ on the balance sheet and the numbers look good. There is no material difference between that and the central bank just discounting the ‘other assets’ asset it pops into being as required and creating money out of nothing. You put the same amount of your own money into circulation, but this time you have spare capacity because you are not using your productive mechanisms to chase surplus ‘hard currency’ from abroad. Your export sector is materially smaller and you have space to produce more for the domestic market in a non-inflationary manner. The result is a materially higher standard of living and one that is sustainable as well. But nobody has done that yet because bankers get spooked discounting ‘Other Assets’ rather than ‘Hard Assets’. The first country to break the taboo will become astonishingly wealthy practically overnight and everybody else will be falling over themselves to emulate them. Mel, thank you for the reply. In my understanding of history, the countries that followed export led ‘mercantilist’ strategies did actually develop and prosper. Some examples would be Britain in the 18th and 19th centuries. USA in 19th and 20th centuries. Japan, South Korea, Germany, and China more recently have also seemed to benefit from what many economists describe as a policy that imposes large costs on the exporting nations. Either my perceptions about why those countries seemed to benefit are wrong, or there is something wrong with the idea that it is an unsustainable strategy that actually hurts the countries that employ it. Which is it, or what am I missing? Thanks Neil. I hadn’t seen your reply, which is very good. I agree that your strategy would be better if we could just get them to use it. I am not too familiar with export/import in general, but Warren Mosler once said that the purpose of export is to get import. In China’s case, they are toiling their citizens away to make products for the rest of the world. They get a balance in a checking account in the US (let’s say) for that. With that balance, they can import technologies that are not available in their country to use and/or take apart and develop their own high-tech sector (to better citizens’ living conditions I hope?). In a real news interview, Michael Hudson has said that China needs the reserve otherwise United States can hurt China’s economy somehow, but the goal of China should be to make goods and services for the benefit of its own citizens–not foreigners. Certainly, on the other hand, China has its own oligarchs that have benefited off of this system of low wage workers toiling away making & exporting goods to foreigners instead serving China itself. I think many people can’t purchase a home in the West (and Australia?) because of these wealthy Chinese people driving the prices up. I think Mel is right about some countries not able to service their debt owe to China. Hypothetically, European countries can go bankrupt and if they do then its bad for China too because China will lose its money denominated in Euros. The US has no solvency issue, so bankruptcy doesn’t apply. Mosler also said what if somehow some guy/gal in the federal reserve loses China’s balance, China won’t have anything to show for its products (not suggesting we should do that, we need to be fair and honor our agreements with others). Fundamentally, export keeps domestic demand up and people working. (It is better than digging holes then filling it up because people can clearly see that’s pointless). Companies are efficient, they can make products for all its people’s needs with only 5 percent of the labor force, so the rest are unemployed. Exports keep people employed, but I think that it would be just and fair for regular Chinese people to get the fruit of the labor rather than having just a few getting wealthy. Instead of exports, I think their government could have the people do something else that is more worthwhile. I wonder if Chinese leaders see export as a strategy to make people in United States living more and more horrendously to curtain the state’s imperialist agenda because our leaders are scared of large negative numbers. Please correct me and direct me to the correct info if anyone see a problem with my view. The above is what I think the situation is like after learning a bit about MMT. Thanks Bill for linking the spending multiplier model. I was just discussing something along those lines with my father when he was driving this morning. What is ‘discounting’ an asset by the central bank? I just want to say that I didn’t see Neil’s reply when I was typing my response up. Then I came back after I worked on something in my lab to finish my reply. My comment at 10:15 was before I looked at Neil Wilson’s comment. but isn’t there an end game in this as well , in that at some point the increases in the wage rate and the cost structure in the economy means a country might go from net creditor to net debtor and foreigners are going to have to be prepared to accept your liabilities , and that requires trust in the rule of law , not just a tax driven currency ? that’s the problem for china down the road isn’t it? and given the capital drain , that fork in the road for china may happen sooner than we think. I think Neil is saying that a nation has its own currency can employ its own labor to make goods/services for the betterment of its citizens’ standard of living instead of for foreigners just to make the books look nice. If your labor force is not making exports (because maybe you don’t need as much foreign currency), but is producing good/services (like taking care of old people), then your standard of living must necessarily be higher than if you have diverted some people to manufacture items for foreigners. Is that not one of the main points of MMT? That countries have more freedom than they think if they realize that a sovereign government can purchase any good/services and can incentivize/pursue any progressive program it wants? As for going from being a creditor to a debtor, if a nation becomes a debtor, that means whoever sold stuff to that nation wanted financial asset denominated in that nation’s currency (checking account balance at first). If he/she didn’t want that financial asset, he/she won’t have sold stuff to that nation. Finally, nations like China and USA are not going anywhere. I think having savings in these currencies is pretty safe. I think China will be fine. Unless there is a natural catastrophe that wipes out the labor force/productive capacity, the nation’s leaders can always choose to go to a green sustainable future without worrying about inflation. “More brutish than bright and it takes some time for them to work out what we have known all along.” One has to work in large corporations to really know how dim their upper management is – blindly wedded to silly corporate ideology – with those beneath almost entirely brown-nosing sycophants. And the stifling bureaucracy is far worse than I ever encountered in my 10 years in Government. No wonder it would take generations to work out the obvious. Tom, I can only try to explain my own understanding of what Neil Wilson said and most of the things you mentioned in your question I agree with. I accept that what Warren Mosler said about that exports are fundamentally about enabling imports is true. I believe Neil pointed out to me that what happens when a country follows an export led (mercantilist) growth model, they are exporting demand for their products because of a mistaken belief that they need to show accumulations of foreign currencies as an asset on their balance sheets. I believe that Neil makes a good point that this is just a misguided, mistaken belief, and that a country could do the same thing by satisfying their internal demand rather than by pretending they need the foreign currency as an asset on their balance sheets. That is what I think is meant by the term “discounting” as he uses it. And that realization of actual possibilities allows for policy that would be much better for the citizens of that country than the export led strategy. Which is why I think it was a very good answer to my question. Of course it leads to the question of how we can get policy makers to understand this. I don’t know that answer because as you also point out, there are always people who benefit from the way things are currently done, and they seem to be resistant to understanding anythings that might reduce their current benefits. Not forgetting invisibles. Balance of payments is more than just imports/exports. Thanks, though I am still not sure what the word ‘discount’ means in Neil’s comment. I will keep working on it. export surplus there is a corresponding penny or cent of deficit somewhere else. costs and can protect from importing inflation. Net exorting is stupid. The only reason why a nations net-export is to enable its non-govt sector to accumulate net financial assets denominated in foreign currencies, which it does because its central govt isn’t running a budget deficit large enough to enable its citizens to accumulate net financial assets denominated in its own currency. A currency-issuing central govt (CICG) could always purchase the difference between exports and imports, pay exactly the same price for the resources that are used to produce the net-exports, which would mean the same GDP and same employment level, with the difference being that the resourcse would stay in the country, end up in the hands of the CICG, which could use them to build more schools, hospitals,universities, etc. Net-exporting is an indirect form of foreign aid, which the Chinese have finally woken up to. China hasn’t prospered any where near as much as it could have. The Chinese Govt is now pusuing a domestic consumption-based policy, which is bad news for countries like Greece that have de-industrialised over the pst 40 years and have been spared 3W status by a very generous net-exporting China willing to accumulate net financial asets denominated in Euros because the Chinese Govt hasn’t been running suffiently large enough deficits. Exports are what a country gives up to the ROW and only makes sense to finance import spending. Phil Lawn, yes I understand that there are good reasons to think that net exporting is stupid and that if people only realized that they could stimulate internal demand for many products then they wouldn’t need to export as an excuse to employ people and build industries. Neil Wilson @5:50 did a good job of explaining that. Even so, there is still the issue that countries that have followed the mercantilist, export led, net exporting plan seem to have done a lot better than countries that haven’t in the past. So even though there is the argument that they could have done even better if they hadn’t bothered following through with the actual physical exports, but consumed those themselves, there are issues as to why nobody understood this and, rather, decided to actually do the export thing. And as to why it seems to have worked out for many of them. So part of my original question does still remain- why does it seem that countries that follow a stupid policy that imposes costs on their own economies and people, why does it seem they have managed to prosper despite that? I mean generally you don’t find that stupidity increases your chances of success right? accumulate foreign net financial currency says Paul. gives them future claims on real resources it is why people want to get richer. It is a significant only reason.Firms want to sell their products . Now Sweden’s social democratic gov. now want to use PPP to build highways! Sweden with budget surplus 2015/16/17 and surplus projected to grow to 2020, a country with low general gov. public debt (40% of GDP) and net surplus (18%). AND a record indebted private sector (~235%). That is with a brand-new PPP financed big hospital that have been expensive beyond any expectations making the headlines frequently. did forget to add that the major banks is in much “financing” the record indebted private sector in foreign currency, the four major banks have about 180% of GDP in foreign currency liabilities. Australia’s once quite advanced manufacturing sector developed behind trade barriers and with government incentives to avoid being killed off at infancy by the major players at that time, the US, Britain and to a lesser extent Germany and later Japan. As mentioned by Bill nearly all developed countries followed this approach. During the period between Gough Whitlam’s and Paul Keating’s Labor governments, trade protection for Australia’s manufacturing industry was substantially reduced, many jobs were lost but those businesses that improved their productivity, quality and innovation under the moderate levels of trade protection and support at the time performed quite well. For example just prior to the GFC Australia was a substantial car exporter and there was significant levels of processing of our mineral ores to base metals for example. The real collapse however occurred when under John Howard the process of free trade agreements with low wage and industrially capable nations starting with Thailand began. Just as the East Asian tigers attained first world levels of manufacturing proficiency and most retained access to low cost labour, comprehensive government support measures and low government imposed costs like taxation and environmental standards, Australia’s leadership fell for the lie of neoliberalism and totally free trade which set up the perfect storm of de-industrialisation. Most economists to this day support the killing off of our supposedly ‘inefficient’ manufacturing sector in the hope that more ‘efficient’ sectors like mining and bulk agriculture will thrive. They should have been the first to be retrenched. So later this year the modern Toyota car manufacturing plant at Altona in Melbourne’s western suburbs will close its doors even though it was built only 20 years ago during Paul Keating’s term, most of the capital expense has been paid off and has been modernised since with an engine plant for example that is only a few years old. The plant has operated at close to capacity from the start and still exports. In addition prior to the closure announcement there were plans to produce more environmentally suitable plug-in hybrid vehicles and possibly later hydrogen fuel cell powered vehicles but Tony Abbott’s and Joe Hockey’s rejection of Holden’s modernisation and new model introduction proposal convinced Holden that they were no longer welcome and this fatally damaged the economies of scale of suppliers which along with the current appalling industrial policy settings convinced Toyota that it was simply now more profitable to import. A 15% tariff on car imports or the equivalent ongoing subsidy would have tipped the balance to retaining an Australian vehicle manufacturing industry that would have been competitive in export markets. Other established industries with ongoing potential such as white goods manufacture, car component manufacture, building materials and products, steel making, oil refining, petrochemicals, defence sector products and services and thousands of smaller but valuable manufacturing businesses have or soon will also close down. We all know where the real ‘leaners’ are and they are in the financial services sector, the real estate speculation sector, the ‘not taxed’ mineral and energy resources sector, the privatised monopoly utilities and all the corporations that have been liberated from their taxation obligations and from offering a fair deal for their employees. The ‘lucrative for some’ healthcare sector has also seen a big jump in its share of GDP whilst those without spare cash have seen a decline in health care standards. Jerry, getting back onto the thread of the discussion I agree with you that the countries that have followed the mercantilist, export led, net exporting plan seem to have done a lot better than the net importers. They at least have modern factories, educated productive work forces, lots of R&D institutions working on the ‘future’ areas of technology including areas that truly enhance human well being such as clean energy, environmental sustainability, electronics and computing, more efficient public transport, aerospace or other areas such defence technology for example and are set to grab the bulk of this future business. Compare this with the rust belt regions of the net importers like the US, the UK or Australia. China we all know has serious problems as well such as pollution, environmental destruction, poor working conditions, inadequate healthcare and social support and so on but is so large that their huge exporting sector could be transitioned to more beneficially meeting local needs without too much dislocation which may not be true for Germany. Japan is so short of most raw materials that they need a healthy manufacturing based export sector to pay for essential needs so their economic structure is probably close to where it needs to be for them. No doubt the MMT economists would argue that if more balanced world trade (with no significant net importers or exporters) along with the appropriate degree of national fiscal stimulus/price control with a Job Guarantee to maintain full employment and a comprehensive social welfare/healthcare/education system had instead been followed over the last 30+ years; that all nations could have potentially advanced materially, technologically and in terms of human benefit to an even greater extent than China, Korea, Japan or Germany have experienced and without much of the downsides previously mentioned for China and for the ‘rust belts’ of the net importers. With the MMT economists optimal macroeconomic settings, the transitioning of global production to the best producer would likely have been more gradual and not as extreme and I don’t think most consumers would have been disadvantaged by this as global technological levels and productivity could have been fairly similar with significant competition arising from more dispersed global production (more players in the market), and of course consumption demand, material well being and overall human benefit levels would have been significantly higher. The consequence of higher levels of global consumption demand that would arise from the global implementation of the clearly beneficial MMT economists macroeconomic settings in a world in critical danger from global warming and environmental destruction, places even greater emphasis on the necessity for proper governance that prioritises reducing the human contribution to global warming, the transition to environmental sustainability, the protection and restoration of the natural world and the enhancement of human welfare and happiness. Leaving this to the market and the corporate board rooms WILL NOT WORK and effective governments and properly functioning democratic processes are more essential than ever. 1. When the optimal national macroeconomic settings are NOT in place then exports provide an avenue for production, sales, employment, technological progress and improved productivity for a business and potentially a large segment of the economy; that otherwise would not have been available in a stagnant and undeveloped domestic market – a bit like the path China or Korea initially followed. The foreign currency reserves can still be used for lots of nice things like commodities, appreciating foreign investments or overseas holidays can they not? 2. The Middle East oil producers and Norway that have plenty of surplus fossil fuels but relatively small populations and have ‘saturated’ the current material needs of their populations have an incentive to sell their fossil fuels as quickly as possible, increasing market share, before the essential global transition to clean energy kicks in and their fossil fuel reserves and infrastructure become stranded assets. The fossil fuel export royalties (presumably denominated in foreign currency) can then be used to buy longer lasting investments like shares in major foreign corporations, foreign real estate or gold bullion for example that can later be sold off when needed to pay for imports. This is the idea behind Norway’s sovereign wealth fund. 3. Similarly Russia during WW2 paid for their vital imports of weapons, munitions, machine tools and other needed supplies primarily from the US and the UK with their extensive gold reserves and some other commodities as the US and the UK would not accept roubles or IOU’s. So from a national defence point of view for some nations it may be beneficial to net export so as to be then able to build up a reserve of a valuable commodity that could be sold during periods of major war? But then again cases 2. and 3. may be groundless as these foreign commodity or asset purchases to build up a ‘secure reserve’ would mean that these nations were no longer net exporters?? Similarly if China were to go on a foreign asset buying binge with their huge foreign currency reserves at some point then they also may switch to being a net importer nullifying their net exporter period, but they could potentially end up owning much of the world’s corporations, real estate, commodity reserves and even politicians?? Perhaps the key point is that substantial net exports over a long period, like China has attained, causes too much wasteful dislocation and mis-allocation of capital and human effort for both sides of the trade equation and could even end with us becoming serfs to our rich Chinese, Korean, German, Indian, American……. and local wealthy overlords?? Wait a minute that has already happened!